Novellas can be a tricky thing. They’re not full length books, but they can sometimes still demand the same price. All Systems Red comes in at just 150 pages, so it’s a quick read, but despite the length of the book, the true importance is the impact of the story. That’s where this one shines. All Systems Red stands out. The style and narrative of the story, the voice of the main character, it grips you right from the start and compels you to keep going. There’s humor, there’s action and there’s mystery as this sci-fi tale pokes it’s head into the waters of a very interesting universe. It’s one where hi-tech gadgets are curbed by businesses cutting corners to save costs. A place where planetary explorers get in over the heads with vicious lifeforms and deadly technology. But most of all, it’s a story about a murderbot who just wants to watch tv. “I could have become a mass murderer after I hacked my governor module, but then I realized I could access the combined feed of entertainment channels carried on the company satellites. It had been well over 35,000 hours or so since then, with still not much murdering, but probably, I don’t know, a little under 35,000 hours of movies, serials, books, plays and music consumed. As a heartless killing machine, I was a terrible failure.” And so the book begins with the main character. A robot. A murderbot. Murderbot doesn’t have a name. It’s official designation is simply SecUnit, short for security unit, and it’s tasked with the security of a scientific team on a far off planet. Murderbot is just one cog in the wheel of futuristic commerce. Corporations sell out shares of prospect worlds to parties interested, who in turn rent or buy all the equipment needed to explore that world, which includes security units like Murderbot. 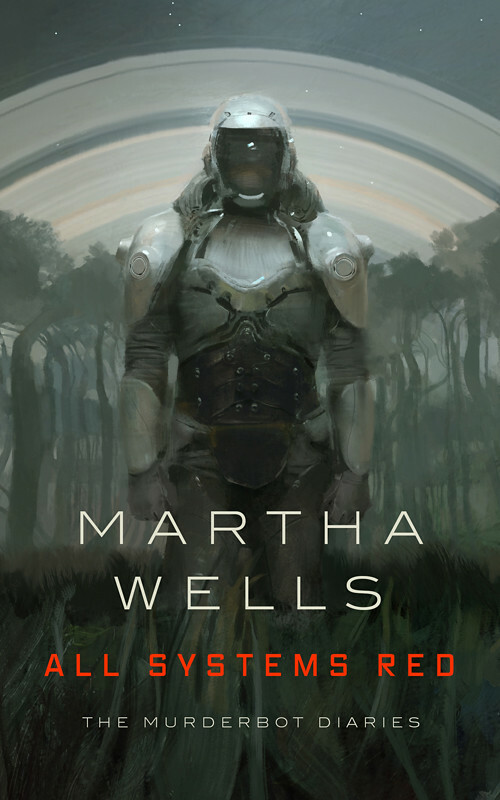 Part machine and part cloned human, Murderbot has no gender and, theoretically, no freedom. However, thanks to a hacked governor module, Muderbot has quite a lot of freedom. In most stories, that freedom would lead to a robot killing its masters to seek its freedom. In this story, Murderbot ends up travelling a very different path, which is what makes it fun. Now I don’t want to spoil the story, so suffice to say Murderbot goes on an adventure on this alien world with a team of scientists and it leads to plenty of action and mystery. Yet the key that glues it all together is the humor. Murderbot’s peculiar personality leads to some very fun quirks that makes the story so enjoyable. Murderbot knows it’s a piece of junk made by a corporation using the cheapest parts to maximize profits. This in turns leads to some self-deprecating humor. On the other hand, you have this extremely advanced machine in comparison to what we actually have in reality. Murderbot has a true artificial intelligence and is capable of making its own decisions and having its own wants and desires. So what does an AI do? It watches tv. That right there is hilarious. While novellas can be a hard sell, All Systems Red is a must read story. Seriously, this is a sci-fi story you should check out. It’s fun, unique, quirky, and a pure joy to read. This story in itself is rather self-contained, however there is another book on the way. Hopefully we’ll see even more as I absolutely loved this one. I give All Systems Red a five out of five metal bikinis.